Emily Bergl: "Sun In An Empty Room"
My first full day in Paris was the last day of the held-over Edward Hopper exhibit at the Grand Palais. Apparently, this was the hottest ticket in town, much like the Marie Antoinette exhibit I saw at the Grand Palais the last time I was in Paris. But unlike La Reine, this Hopper show broke attendance records for the Grand Palais. The show was extended and on the last day, the museum was literally open 24 hours, admitting people 'round the clock. So we got up before dawn, grabbed a quick croissant, and headed over to the museum. It was ironic that we came to France to see an exhibit of one of the greatest American painters. And it is also ironic that an American artist broke attendance records for a museum in Paris! I had seen a very comprehensive Hopper retrospective at MOMA in San Francisco in the 80s, but this was a nice opportunity to revisit some art that I love... and my partner had never seen any Hoppers in person. So we braved the cold (29 degrees, thank you very much) for two hours until we finally got in. The show itself had a clever start. Hopper's early works were positioned in galleries against other works of art of the time, and works by other artists he admired or studied from, particularly here in Paris. But the rest of the show, I must say, was organized a bit oddly. Instead of seeing Hopper's work chronologically, in order to trace the progression of his skill and vision, the paintings were thrown together despite their year of creation. If this technique had been used to highlight thematic motifs or something of that nature, I would have understood. But it struck me as totally random. Mais c'etait pas grave, as the French say. It was still wonderful to see these paintings, many of them feeling like old friends (House By The Railroad, Rooms By The Sea, Automat, and of course, Nighthawks), up close. But there was one painting that I had somehow missed in my art history classes, and my own exploration of Hopper. Painted three years before his death, Sun In An Empty Room was the final image in the exhibition, but was not the last finished painting created by Hopper. The decision to close the show with this piece was absolutely spot on since it seems to embody Hopper's entire career. It is the distillation of everything he had worked for, and his entire visual vocabulary. Sun In An Empty Room is a haunting painting, so full despite its emptiness. Hopper was 81 when he captured this image, a man at the end of his life. As with so many Hopper paintings, there is a dual emotional state going on: emptiness about to filled, or a space that was filled and is now vacant. Considering Hopper's age, the vacant idea seems to be the most relative; the canvas seems to speak to the Buddhist idea of the vast "all" of the void. 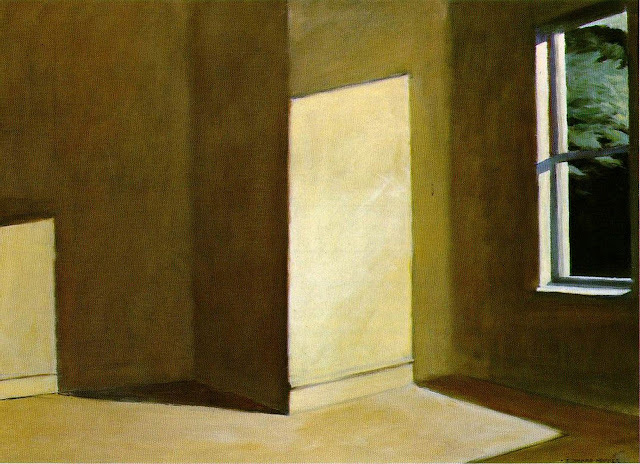 Like most of Hopper's work, the composition suggests the cinema or photography, framing what we see without a context. A room full of nothing but sunlight, a room full of memories and meaning, a room that will one day no longer exist. Transience. Ephemera. I stood for many minutes in front of this spectacular piece of art, moved to tears by its poignancy, gentleness, and finality.